This Vegan Chocolate Cake is so easy to make that you only need a bowl and a whisk. 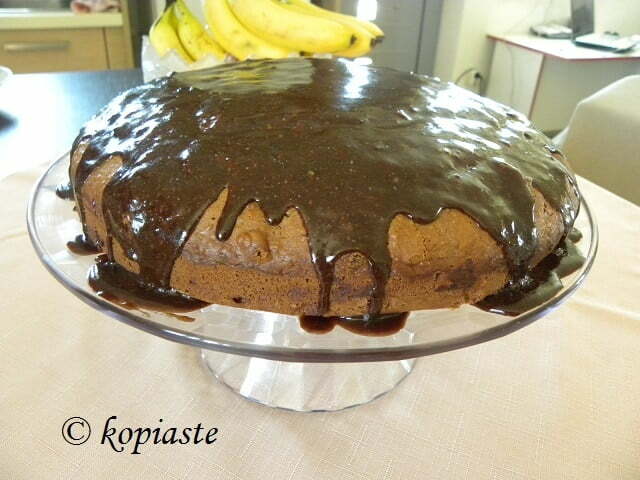 I’ ve made this cake many times and today I made it for the Greek orthodox fasting period. As I will be busy all day, I took the pictures while the glazing is still wet, as I doubt I will find time later for photos. Before preparing flaounes, tsourekia and dying my red eggs, I made this cake and muffins as it is cold and I wanted to use the oven so that the kitchen is warm, for the dough to rise. This is one of the easiest cakes to make as you just mix all the ingredients together. It does not contain any eggs or milk which makes it perfect for those fasting. In the muffins I added some Corinthian currants and black currants. I used black and white couverture chocolate for the glazing which are vegan. I used my silicone cake bundt form which is not very big so the remaining I made the muffins. I prepared tsourekia yesterday which are filled with a chestnut puree and I glazed them with white and dark chocolate. I melted more chocolate and used the remaining to glaze the cake and muffins. See recipe here. I did not add the cream but just mixed some margarine in the chocolate. Put all the fluids in a bowl and slightly beat with a whisk (no mixer needed). Add dry ingredients and mix with a spoon. Grease a 28 cm baking pan with oil , dust with flour and empty batter or use the silicone bundt form (without greasing) and lined muffin tins. Bake cake for about an hour in a preheated oven t0 170C until a toothpick inserted in the centre comes out clean. Bake the muffins for about 25 minutes. Allow to cool and cover with chocolate ganache. thats a awesome recipe..i just love the combination of orange and chocolate..made a cake yesterday with chcocolate and orange too..loved it..
Everything looks so goood there, if I lived closer I would be knocking on your door right now! Bookmarking these to try out! wonderful & fantastic.. nice clicks.. I can't tell you how long it has been since I have had flaounes!! The cake looks delicious … as does your entire table of tsourekia, lenten cakes and Easter eggs. Kali Anastasi Ivy! What droolworthy treats! That is one lovely cake! Quelle table!!!! Que de bonnes choses à manger. Ivy these look so good. Give me chocolate any time! Καλή Ανάσταση και Καλό Πάσχα σου εύχομαι! Ivy, what a marvelous table you set. Those muffins look incredibly delicious. AND they're vegetarian. You are an amazing baker my friend. That's it! I am making these next! Wow, you are a great baker!